The easyDCP KDM Generator enables the creation of Key Delivery Messages (KDM) for digital cinemas. 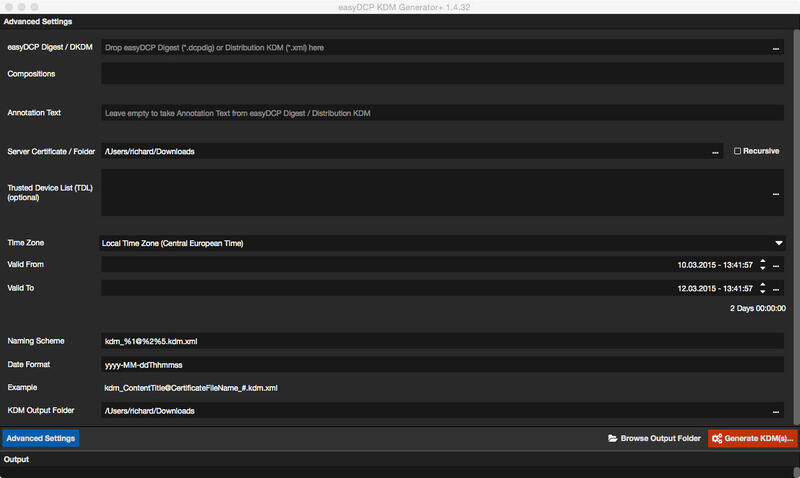 easyDCP KDM Generator+ additionally allows to use external DKDM (Distribution KDM) generate KDM's. A KDM allows the playback of an encrypted DCP for a certain time window on a specific playback device. With the easyDCP KDM Generator(+) you can easily generate hundreds of KDM's within a single run. Besides the KDM generation tool we offer the creation of a personalized and DCI-compliant digital signature for all our easyDCP KDM Generator(+) customers. This enables you to sign your generated KDM's and your customers can be certain that your KDM's are trustworthy. easyDCP KDM Generator is not a standalone product. It is included in the full version of easyDCP Creator+. The easyDCP KDM Generator+ contains extended functionality compared to the easyDCP KDM Generator included in easyDCP Creator+.